And on Friday, I was Sick. 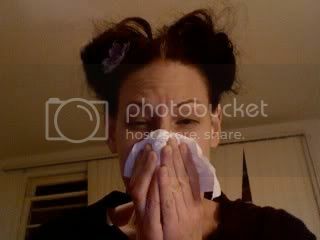 Actually, I woke up Thursday Morning Sneezing a lot. By the end of the day, I said to one of my students, “Wow! 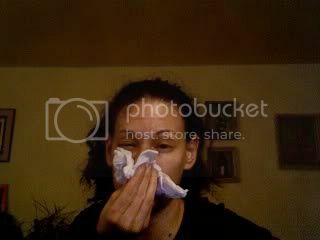 I think I may have A Cold!” I was scheduled to go to Totally Awesome Boyfriend’s House that night and by the time I arrived, I was Ill, Iller, Illest! Of course, I am pretty sure, I Caught Whatever This Nastiness Was from Totally Awesome Boyfriend in the first place. He had been Sneezing and Sniffling all the past weekend. Still, Friday, I had to Work since I don’t work with A Sub. When I got home, all I wanted to do was Crawl Into Bed. And on Saturday, I was Even Sicker. I forced myself to Get Up. 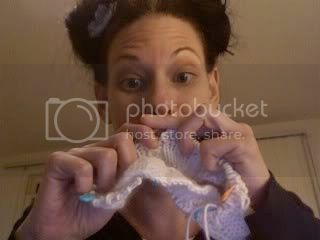 Then, for hours, I Knit and watched Television. Lucky for me, The Style Network had A White Wedding Weekend! Hours and Hours of My Favorite Show, Whose Wedding Is It Anyway?!! I sat there So Long, I finally finished Easily Annoyed Sister’s Boyfriend’s Hat! 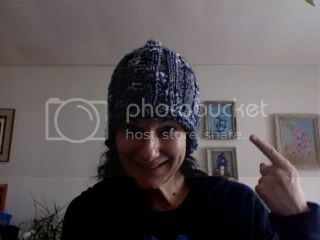 Me, wearing The Finished Hat! I made it from A Pattern I found in An Old Issue of Knit 1 Magazine and used Soft, Multicolored Wool. I think he is going to Like It! Totally Awesome Boyfriend saw me Knitting It one day and was Very Jealous. But, I told him all about The Boyfriend Curse and How I Can’t Knit Him Anything unless there is A Ring On My Finger. He thinks I am Making Up that last part, of course. 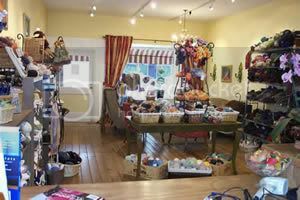 Then, I Got Dressed and went down to Stitch Café for More Yarn! I bought some nice Lush Wool in a Cream Color, per her request. Lush has A Touch of Angora in it so it gets All Fuzzy when it Knits Up. And it is Very Soft. I like Knitting with It. Me, Making Easily Annoyed Sister's Hat! Saturday Night, Totally Awesome Boyfriend came over and he was Very Tired so that combined with My Being Very Sick and it Raining Very Hard, we decided it would be Best to just eat Thai Food and Watch Television. Actually, he took A Nap And I Blew My Nose A Lot. And then We Watched Television. We watched Heavy, The History of Metal on VH1. Not exactly My Scene. But, I was Happy to Pretend To Be Interested, as long as I could Sit Cozily next to My Totally Awesome Boyfriend. I was already starting to Feel Better! Sunday, we did Nothing! Well, we did Our Usual Crossword Puzzle. And then we went out for Delicious Pizza at Our New Favorite Pizza Place in Larchmont Village. It is Seriously Good Pizza! And we are Both From New York – We Know Good Pizza When we Taste It! Afterwards, we walked around. Larchmont Village is this Cute Little Block of Adorable Stores in The Middle Of Hollywood. We saw lots of Funny Gifts, including This Book about Bar/Bat Mitzvahs in the 1970’s and 80’s, called Bar Mitzvah Disco which Cracked Us Up because The Photos reminded us of Our Bar and Bat Mitzvah Pictures! And we saw Jennifer Coolidge! Not in the Bar Mitzvah Book. In A Store. Totally Awesome Boyfriend was Excited. And that is How I Spent My The Daily Randi Weekend! As usual, please enjoy this Fancy Slideshow Recap of The Weekend’s Events, which This Week also includes A Convenient Christmas Shopping Countdown Clock. Please Enjoy. i told u about that pizza place! the owner's a jerk but we used to go there everyday for pizza 'cause it's so good. don't forget about the flower on my hat! actually, I think the boyfriend curse only applies to sweaters. I think a hat is OK.
and I like how you have the equivalent of a "smallpox blanket" to give to your sister's boyfriend. he's going to get sick and not know why! 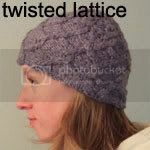 Apparently I'm the last person in blogville to be bitten by the knitting bug, but that's okay because Aimee knits for me! Yay for knitted hats! Uhmuhguh that pizza looks so good. 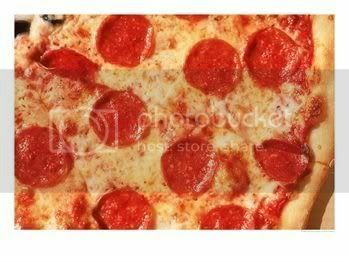 You know when you were little and pizza was just the Awesomest Thing ever and you swore you could eat pizza every day for the rest of your life? Yeah, I never outgrew that. Thank god for self control. lol @ ESC: Typhoid Randi strikes again!